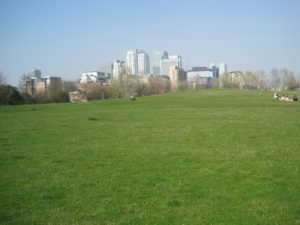 Just to the south of Canary Wharf in the middle of the Isle of Dogs is Mudchute Park and City Farm. This one of the largest city farms in Europe and the largest in London with 13 hectares of land. It is raised up over the surrounding area as it is made of the fertile soil excavated in the 19th century when the docks were constructed. 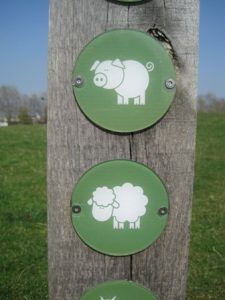 Mudchute Park and Farm is open to the public and is a peaceful place to walk. There are great vistas with views of Canary Wharf and Greenwich Park in the middle distance. The farm has a collection of British rare breeds and currently has over 200 animals including llamas, cows, pigs sheep, goats, horses, ponies, pigs, small animals, chickens, ducks, geese and turkeys. The farm gives horse riding lessons and hosts ‘Animal Encounter’ sessions which are popular with playgroups in term time. The cafe serves breakfasts, lunches and home-made lemonade all of which are excellent. Mudchute Park and Farm was established by the local Island community. It was originally a piece of derelict land created during the last century from the spoil of construction from dredging Millwall Dock. For decades, this hidden natural wilderness of flora and fauna remained untouched. However, in 1974 the site was earmarked by the Greater London Council for the construction of a high rise estate. The resulting public campaign against these plans reflected the affection that local people and those working on the Island felt for The Mudchute. Their success secured it as the “People’s Park” for the area. In 1977 the Mudchute Association was formed to preserve and develop the area. Farm animals and horses were introduced, trees and plants were planted by volunteers and corporate teams, and the educational benefits of the area were also recognised. Local schools were encouraged to use the project to study the natural world on their doorsteps. Since the establishment of the Association, The Mudchute has steadily built a reputation for providing a variety of educational and leisure activities on a London-wide basis.